Just when you thought that the Democrats couldn’t get a more Stalin like character, look no further than Duke Nuke’m himself, congressman Eric Swalwell. Kudo’s to CNN’s Jake Tapper, yes I’m giving Tapper credit as he cornered Swalwell on the insane gun control notions he’s running on. 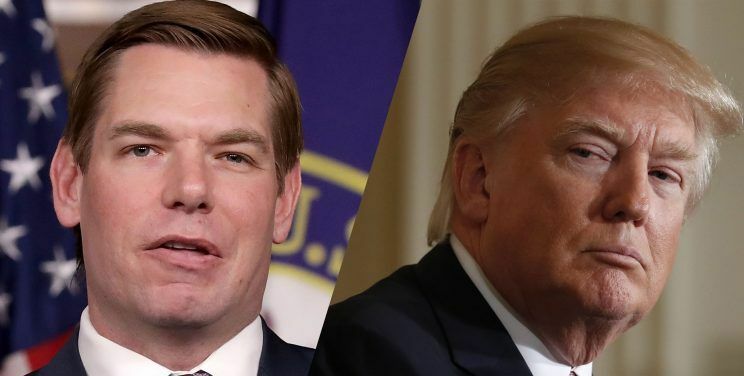 SWALWELL: “Well, Jake, they would, but I also offer an alternative, which would be to keep them at a hunting club or a shooting range. And the reason I have proposed this is because these weapons are so devastating. I have seen this as a prosecutor in the cases that I’ve prosecuted. We have seen these in the school shootings, from Sandy Hook to Parkland. And I was just at Parkland earlier this week doing a town hall there. Let’s not forget that I’ve nicknamed Eric Swalwell Duke Nuke’m for a reason. When he got into a debate with my good friend Joe Biggs, he threatened to Nuke American citizens over our 2nd Amendment rights to bear arms. Swalwell is an absolutely nut bag. He proves it every day with his rhetoric. He’s still claiming to have Russian collusion evidence, yet he didn’t think to hand that over to Mueller’s team if it were true? If you vote, and you’re even remotely thinking about voting for this guy, do the rest of us a favor and pull your lip over your heads and swallow. “To conquer a nation, one must disarm its citizens,” Adolf Hitler.